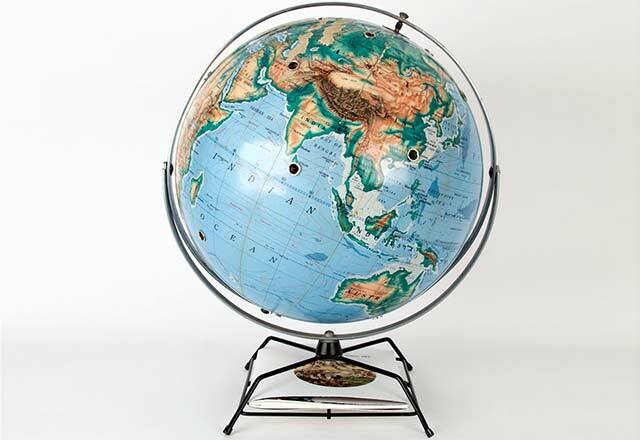 The Worldviewer 60 is a 16” vintage globe with sixteen wide-angle door viewers mounted on the surface at different latitudes. 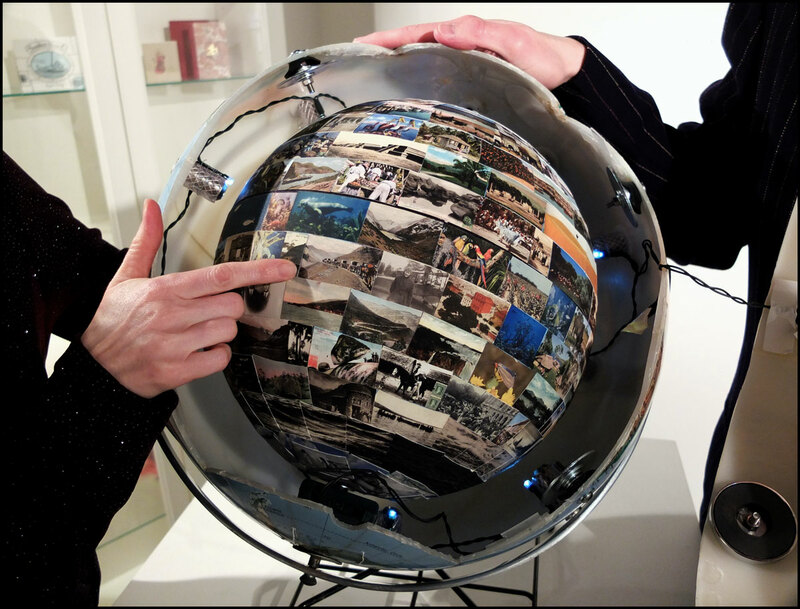 The viewers reveal the surface of a second, nested globe entirely covered with some 300 images, illuminated by battery-powered LEDs. 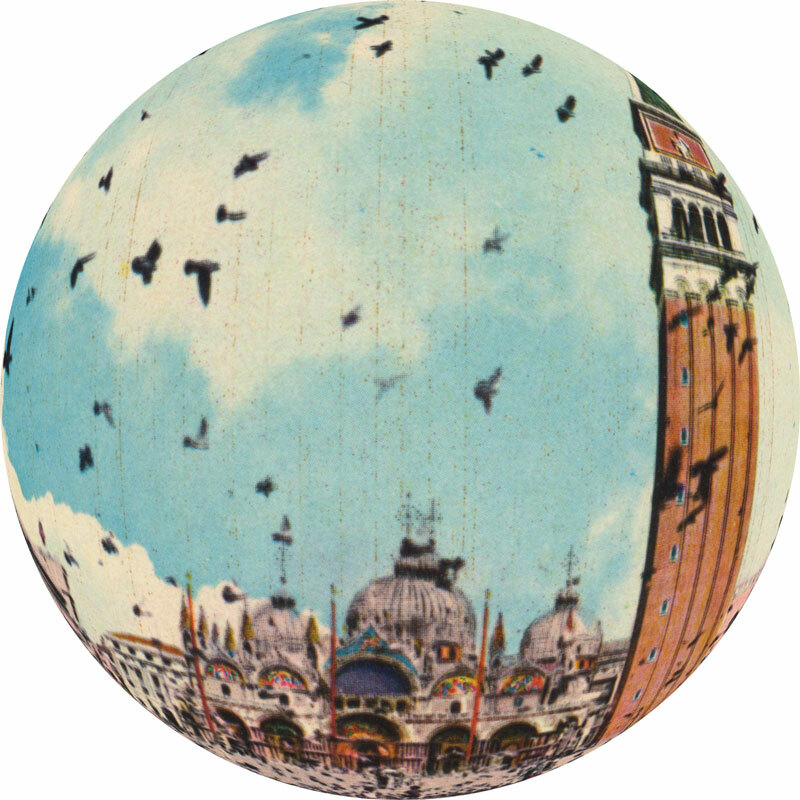 The outer globe can be rotated 360° in all directions, while the inner globe remains fixed to the axis, allowing the user to circumnavigate the image surface at a given latitude. 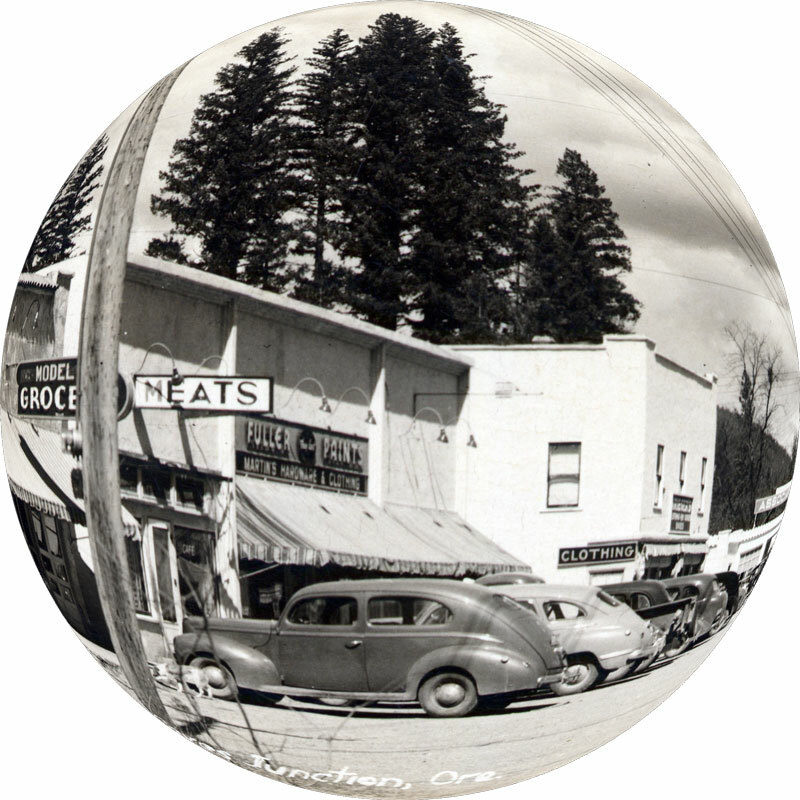 All the images visible through each viewer relate to its latitude. 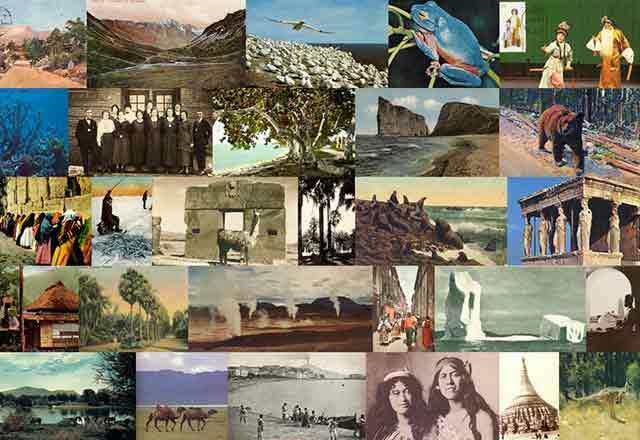 The vast majority of the images are from found postcards of the early and mid-twentieth century. 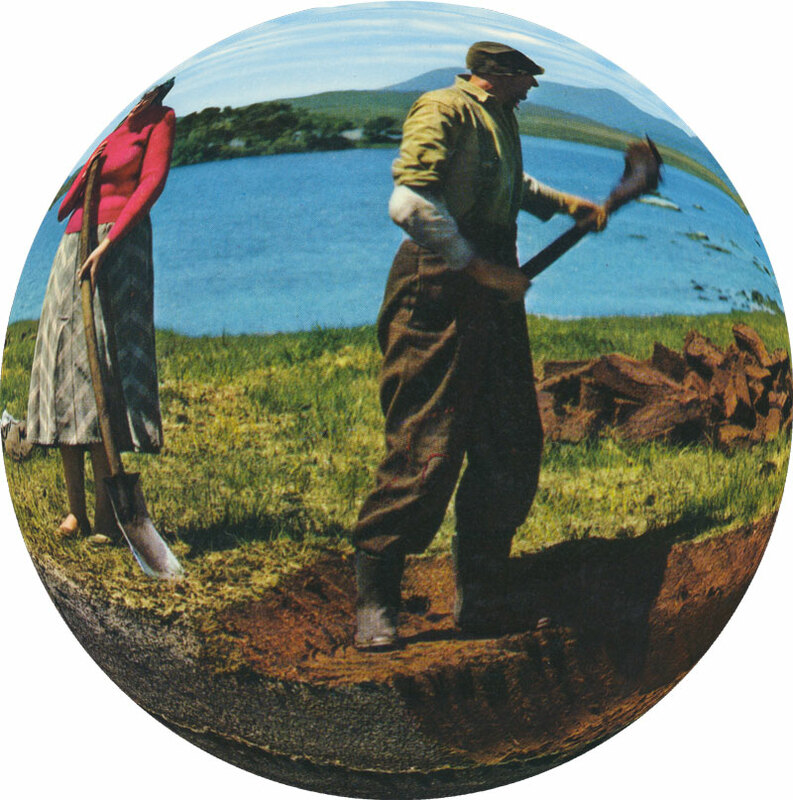 You and your Worldviewer 60 is a unique artist's book (8" x 8") made to accompany the globe. 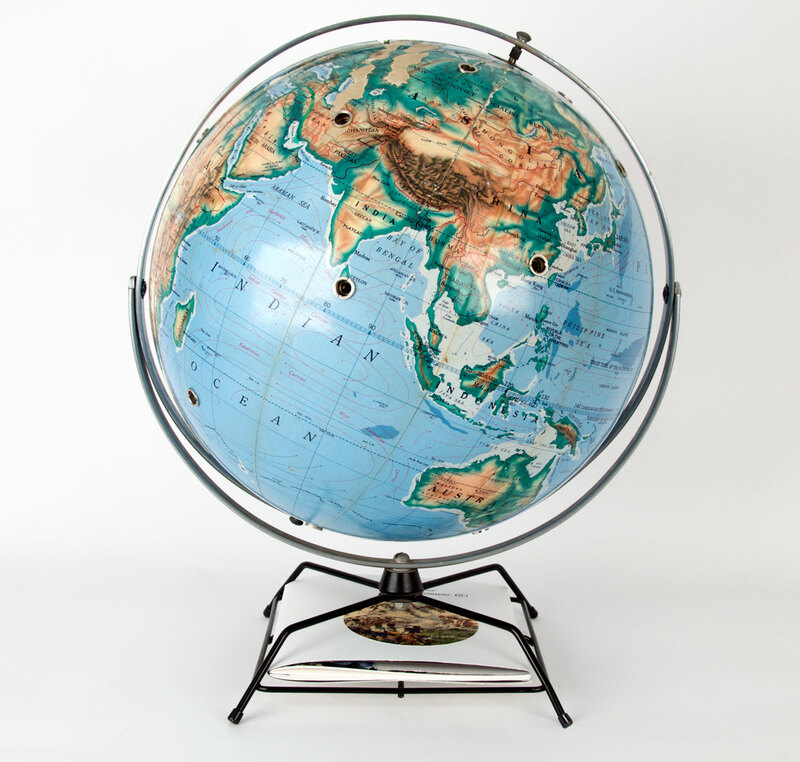 It features larger images related to those in the globe, as well as text by Leo Daedalus. 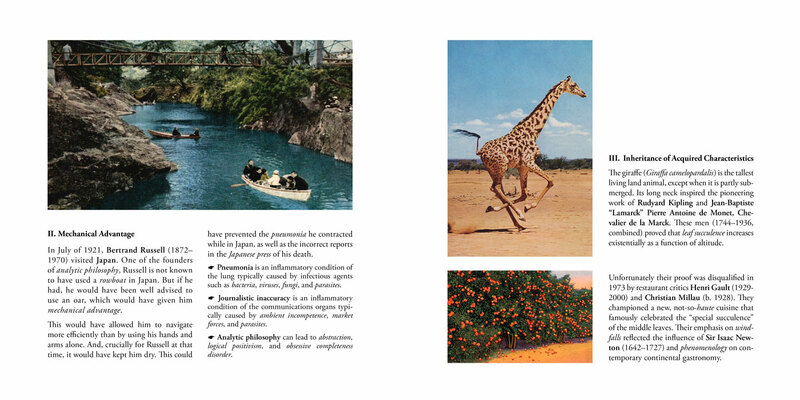 A slightly modified 6½" x 6½" version of the book is also available separately in a limited edition. 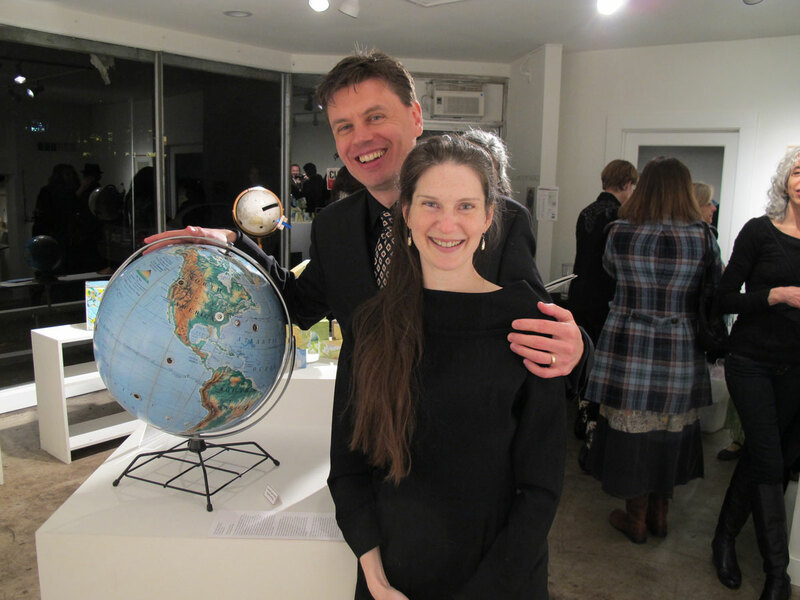 The Worldviewer 60 was originally created for an exhibition at 23 Sandy Gallery curated by Robert Tomlinson and Laura Russell, running December 2–31, 2011 in Portland, Oregon. 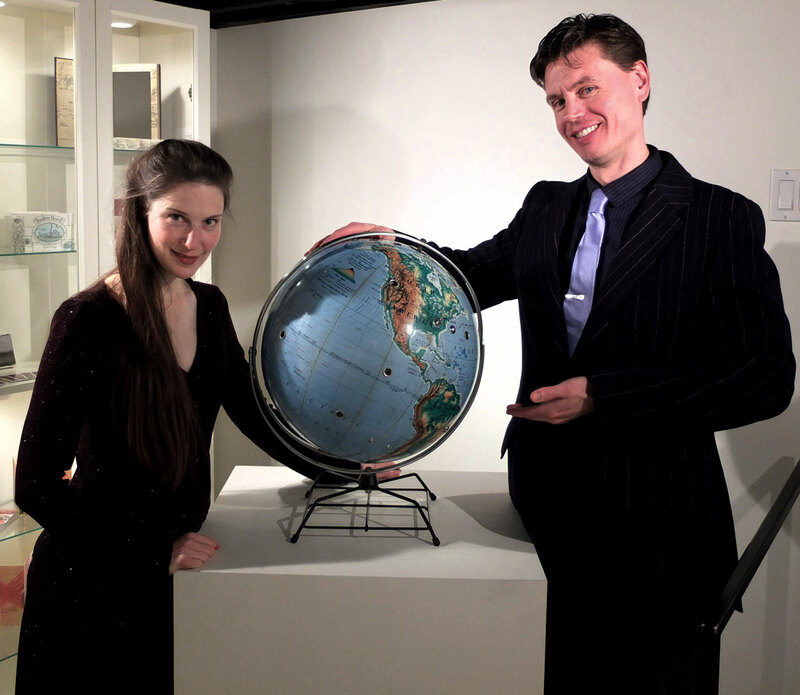 The project was conceived and developed by Anna Daedalus and Leo Daedalus with Samuel Miller in September–November 2011. 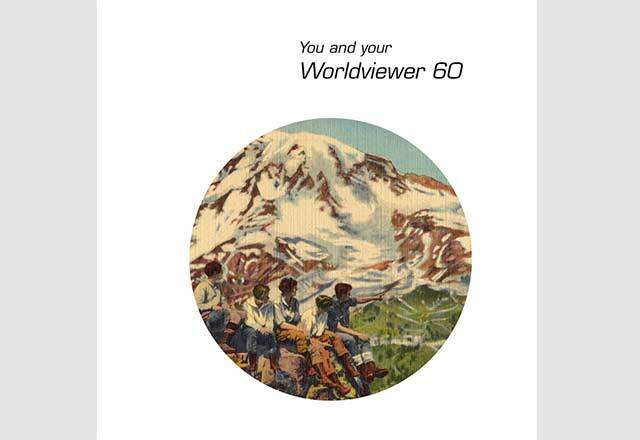 The standalone artist's book You and your Worldviewer 60 is available from 23 Sandy Gallery. Contact 23 Sandy to ask about this title. 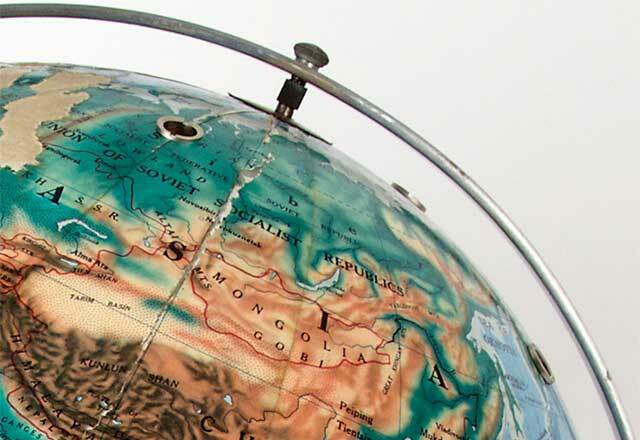 The Worldviewer 60 looks back to a pre-digital era when matter did the heavy lifting in the way we communicated about the world. 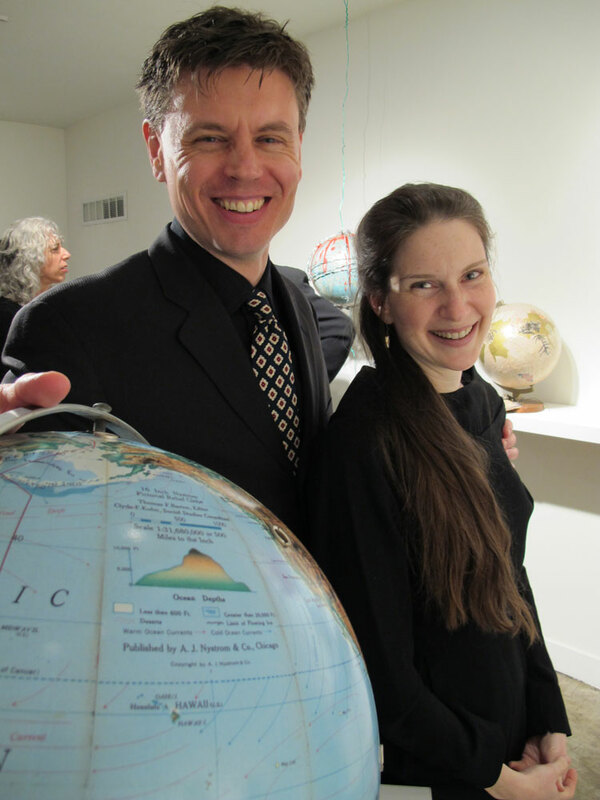 Families bought globes for the kids, not as decor but as pedagogical and self-improvement tools. 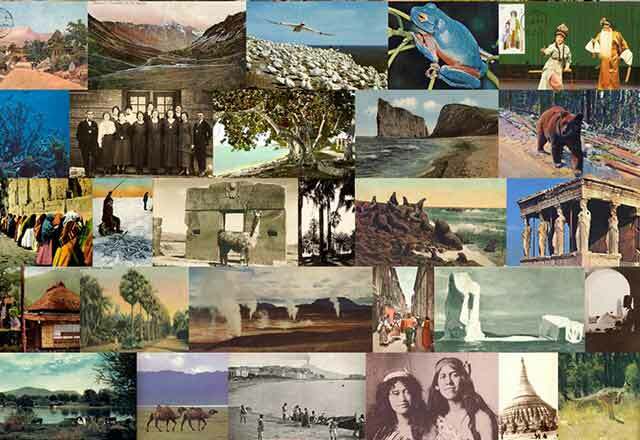 People mailed postcards, not to be nostalgic or cute but because paper, carried across the world by human beings and their vehicles, was how we networked at a distance. Information that today seems too volatile to commit to print was weighed, curated, and designed into long-labored encyclopedias and Time-Life volumes. That expensive 1952 encyclopedia set held forth on Piltdown Man with undiminished authority in 1954, and it still does, ever proud in its embracing mildew. 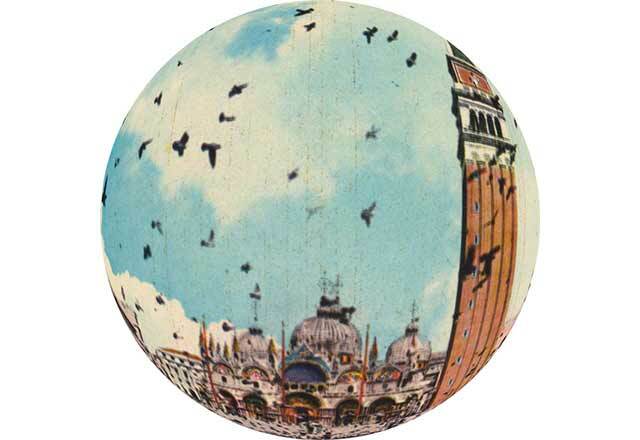 That book, that globe, was a commercial monument to the striding positivist project of its day, when elaborate dioramas roamed the earth and maps reached out to overtake their territory. Today we may smile at that time, but we do so at our own peril if we imagine we have outpaced it. Quite the contrary; we have only found a new, more mercurial language for it. 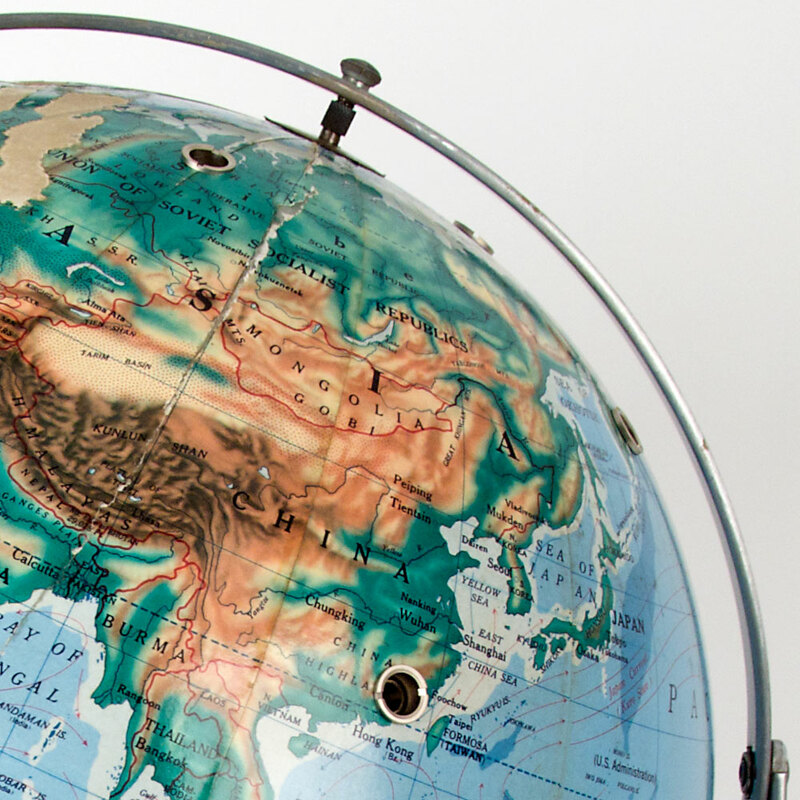 Our satellite maps and infographics quiver in what we, no less self-satisfied than ever, call "real time." 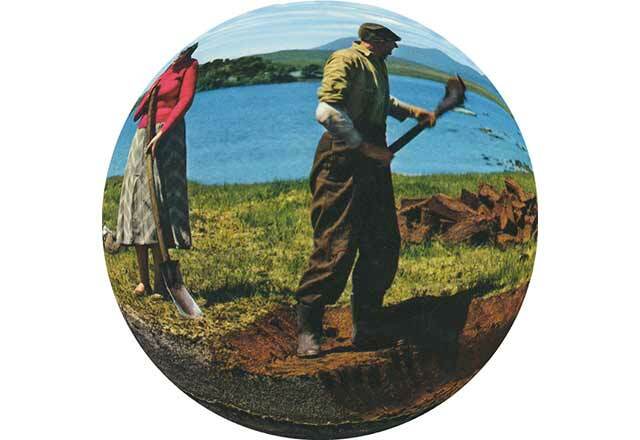 Our knowledge has shed a unfashionable attention span, but not its self-importance. 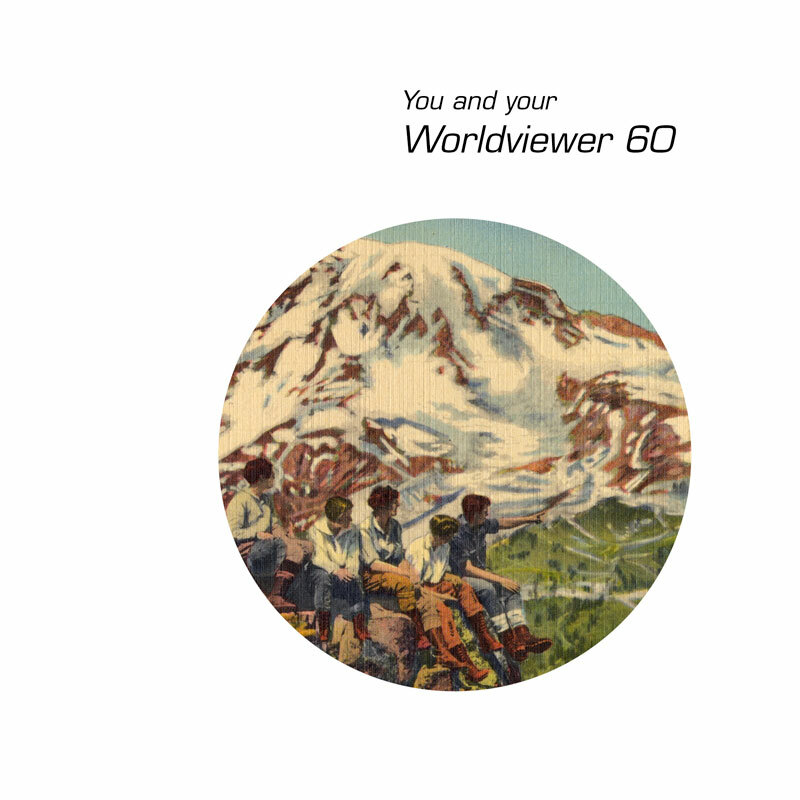 The Worldviewer 60 is a eulogy, winking but not ironic. Nostalgic, yes, but with a nostalgia that keeps its accounts current. It is a eulogy for the human scale and the eloquence of matter, and a happy testament to the noble silliness of the human quest for the definitive. 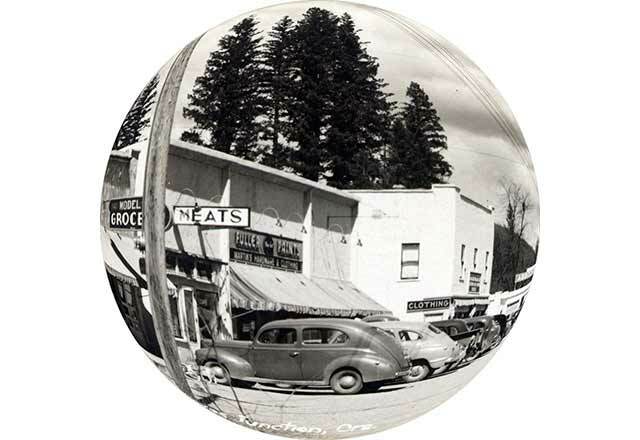 Sooner or later every conviction dog-ears like an old postcard depicting, in broad, declarative colors, condemned monuments from a lost colony. Addressed to Piltdown Man in Lamarck's sanguine hand, the inscription reads, timelessly, "Wish you were here." 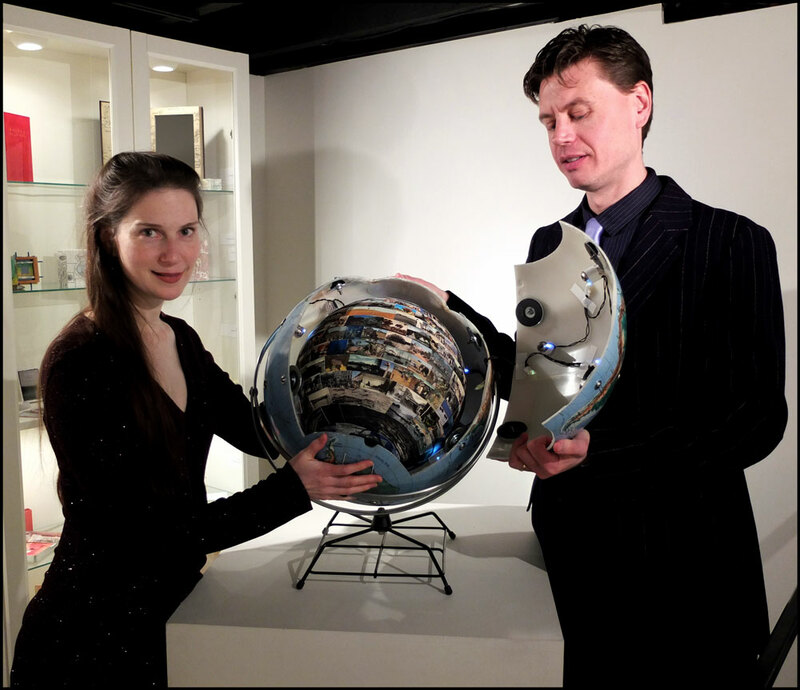 Worldviewer 60 ©2011 Anna Daedalus and Leo Daedalus / Marchland Strand.